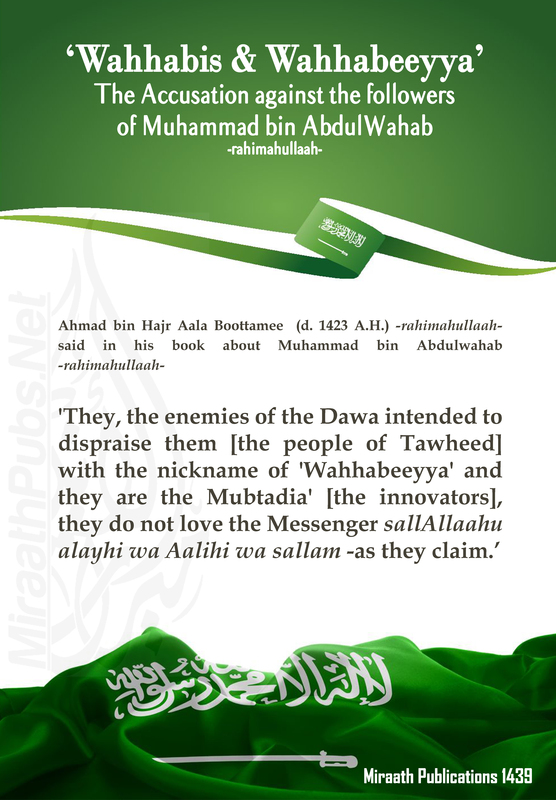 The Nickname of ‘Wahhabeeyya’ Ahmad bin Hajr Aala Boottamee (d. 1423 A.H.) -Rahimuhullaah- said in his book about Muhammad bin Abdulwahab -Rahimahullaah: ‘They, the enemies of the Dawa intended to dispraise them [the people of Tawheed] with the nickname of ‘Wahhabeeyya’ and they are the Mubtadia’ [the innovators], they do not love the Messenger -as they claim. When was the Word first used? This word appeared around 1229- 1231 A.H. /1814- 1816 C.E. It was used by an orientalist named John Lewis Burckhardt who published a book called ‘Notes on the Bedouins and Wahabys’ collected during his travels in the east published in 1831. Is there a difference between al-Wahhabeeyya & as-Salafeeyah? In the second century, there was a sect founded by AbdurRahman bin Abdulwahab bin Rustum (d.197 A.H.) in North Africa. Its methodology and beliefs were that of the Khawarij al-Ebaadeeyah. This sect was called al- Wahhabeeyah in ascription to its founder Abdullaah bin Wahhab ar-Rasibee, it was also called Rustomeey in ascription to his father Rustum. They nullified a lot of the Sharia’ and the pilgrimage of Hajj. Al-Wahhabeeyyah is an ascription to the Beautiful Name of Allaah ‘al-Wahhab’. << To Allaah belongs the kingdom of the heavens and the earth. He creates what He wills. He bestows female (offspring) upon whom He wills, and bestows male (offspring) upon whom He wills. Or He bestows both males and females, and He renders barren whom He wills. Verily, He is the All-Knower and is Able to do all things. >> Ibn Katheer -Rahimahullaah- said: ‘Allaah Ta’ala informs us that He is the Creator of the heavens and the earth and He is The Owner of them and The Controller of them. Whatever Allaah willed happened and whatever He did not will, will not happen. He gives to whom He wants, prevents from whom He wants, there is none who can prevent Him from giving what He wants and none can give what He prevents and He creates whatever He wishes.’ Ibn Katheer continues: ‘Then Allaah placed the people of four types, from them those to whom He gave daughters, from them to whom He gave sons, from them to whom He gave from both males and females, from them those whom He prevented males and females and made them barren with no offspring no son. << Verily, He is the All-Knower >> meaning: about whom is deserving of a division for all these types of divisions. <<is Able to do all things. >> meaning: with what He wants from the different grades of the people from these divisions. بها الزلازل و الفتن , و فيها يطلع قرن الشيطان . “ أما بعد , فإن الأرض المقدسة لا تقدس أحدا , و إنما يقدس الإنسان عمله “ . ‘To proceed, indeed a holy land does not make anyone righteous but rather what makes a person righteous is his deeds.’ In contrast to those people of Bida’ are those who reject this hadeeth and regard it as fabricated due to what it contains from dispraise of Iraq, as was said by the ustadh Salah uddeen al-Munajid in his introduction to the book ‘Fadail as-Shaam wa Damishq’. I refuted him about this with my research of the Ahadeeth in this book. I affirmed that this hadeeth is from the knowledge based miracles of the Prophet -sallAllaahu alayhi wa Aalihi wa sallam. “ ألا إن الفتنة ههنا , ألا إن الفتنة ههنا] قالها مرتين أو ثلاثا , [ من حيث يطلع قرن الشيطان , ] يشير [ بيده ] إلى المشرق , و في رواية : العراق[ “ . “قام خطيبا فأشار نحو مسكن عائشة“ . خرج رسول الله صلى الله عليه وسلم من بيت عائشة فقال : “ رأس الكفر من ههنا …‏” . O people of Iraq! I do not ask you about a minor sin, and you carry out a major one! for a major one: then he mentioned the hadeeth from the Prophet. “ اللهم بارك لنا في مدينتنا , و في صاعنا و مدنا و يمننا و شامنا . ثم استقبل مطلع الشمس فقال : من ههنا يطلع قرن الشيطان من ههنا الزلازل و الفتن “ . يا أهل العراق ! تسألوني عن محرم قتل ذبابا , و قد قتلتم ابن بنت رسول الله صلى الله عليه وسلم , و قد قال رسول الله صلى الله عليه وسلم : “ هما ريحانتي في الدنيا “ . ‘They (al-Hasan al-Hussain) are my Rayhantaaya (beautiful plant with a nice fragrance) from the Duniya.’ From that Fitn is the Shia attacking /criticism of the senior Companions -may Allaah be pleased with them- like the noble lady Aeysha Siddeeqa daughter of as-Siddeeq whose innocence was revealed from the heavens. Abdul-Hussain ash-Sheehi wrote many chapters in his book ‘al-Murajaat’ attacking Aeysha and belying her hadeeth and accusing her of every event, with total boldness and no shame, using weak and fabricated Ahadeeth, I clarified a section of them in ‘ad-Da’eefah’ Along with him twisting the wording of the authentic Ahadeeth and assuming its meanings with which it is not possible to have these meanings just like this authentic hadeeth. This Shia -may Allaah break his mouth and paralyze his hand – imposed this upon the noble lady Aeysha -RadhiAllaahu anha- claiming that she is the Fitnah which is mentioned in the hadeeth.